Arranging artwork has to be my favourite way to accessorise a home. 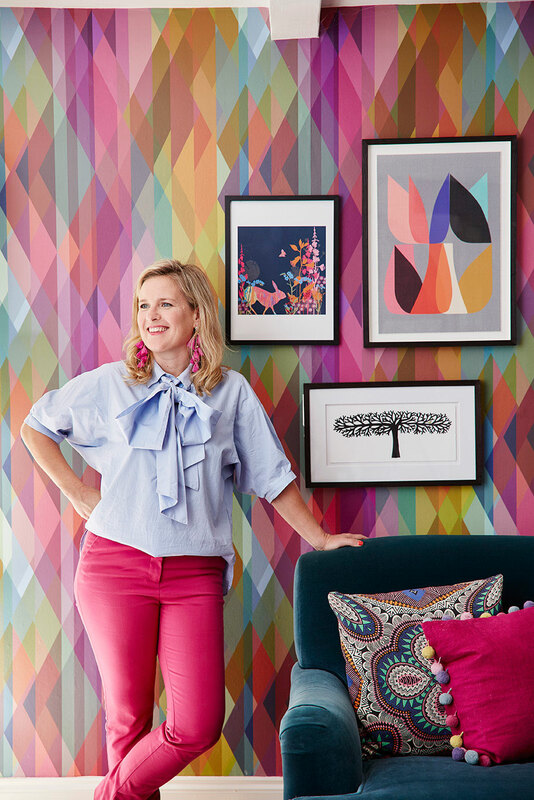 You get to create a focal point, a striking opportunity to add some colour and by far one of the best ways to really personalise your space. BUT I see it done so wrong time and time again so I thought this would be a great little opportunity to give you a five minute master class on how it should be done. Credits from left; House by John Lewis Tiffany Lynch Birdy unframed print, £5. House by John Lewis picture frame in black, £18. Inalux Blossom 2 framed print, £150. Charlene Mullen Long Tree framed print, £75. Ellen Giggenbach Vision framed print, £95. Jill Ray, From The Cliff framed print, £70. Jacky al sammarraie forest perth framed print, £45. East Of India moon and back framed print, £20. Vitra sunburst clock in walnut , £249. 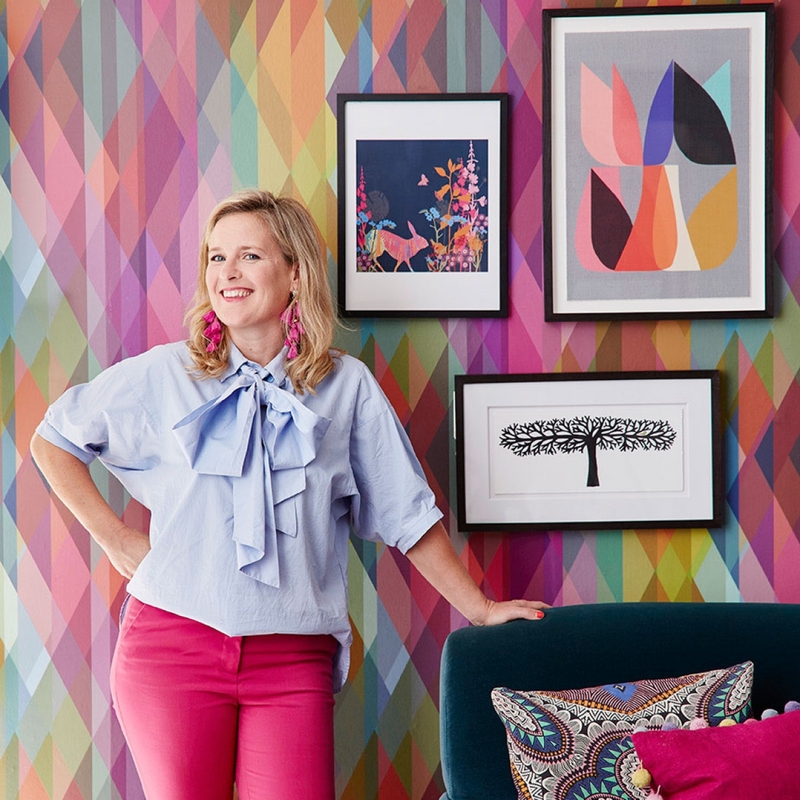 With my design mantra that more is more, this is my favourite way to hang a collection of art, where you gather together all your pictures and group them in one pleasing display. It makes a really strong focal point in a room which can help make a scheme look really together. One thing I really love about a gallery wall is the way it all can grow organically over time. You can switch pictures around and add and subtract. I hate to ever think a room is finished so this playful approach to design is what I really love to do. To get started I arrange all the pictures out onto the floor, and jig them around until I find a pleasing arrangement before popping them on the wall. A few tips on how to get a good layout. Pick a colour story so all your pictures will work and link together. This way you can have fun mixing the different styles and mediums. 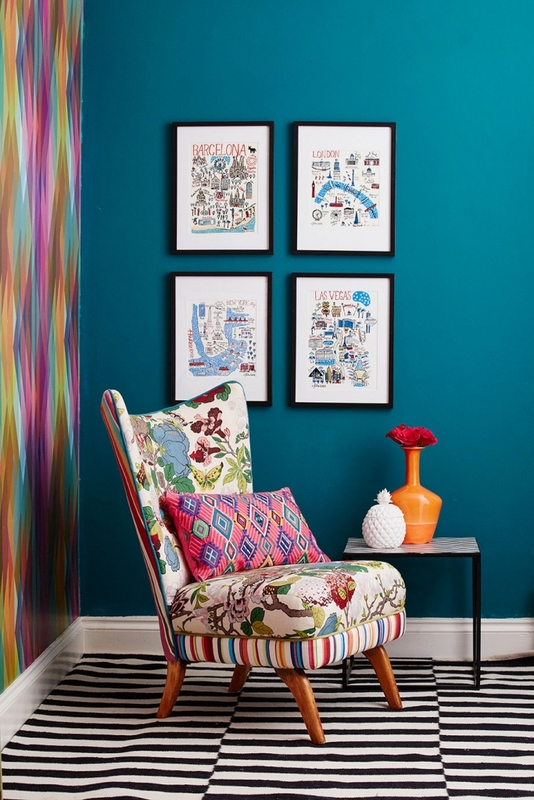 It makes sense that these colours are then also repeated throughout the room design. It’s no mistake that the pictures I’ve collected here match in with the bold wallpaper in my living room. You don’t have to match the frames but it can look more coherent if all the frames are a similar colour. 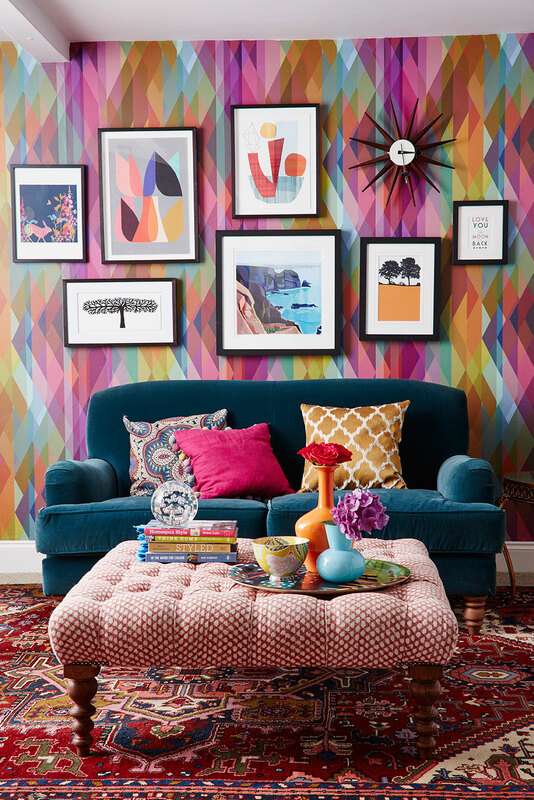 Consider centering the gallery wall to a piece of furniture like a sofa or sideboard. If there is no furniture against the wall you can consider taking the gallery wall all the way to the floor, which looks really cool. Start with one of the larger pieces or hero painting and put this in the middle. Arrange all the other pictures around this one. Sometimes it works to center the pictures, and sometimes it works to line them up either left or right. Keep the gaps between the pictures similar throughout. Throw in an unexpected shape like a clock, mirror or plate to keep the feeling loose. Use command strips to hang the pictures- so you can easily move them around once they are up and you don’t need to worry about nailing too many holes in the wall. You can always put nails or screws in afterwards when you are settled on the arrangement. Don’t be afraid to be instinctive. Play around with the arrangement- this is more of an art than a science. Don’t think that artwork needs to be hung on a plain white or neutral coloured wall to look its best. Quite the contrary- I feel a dark hue works best, as the pictures really pop out. 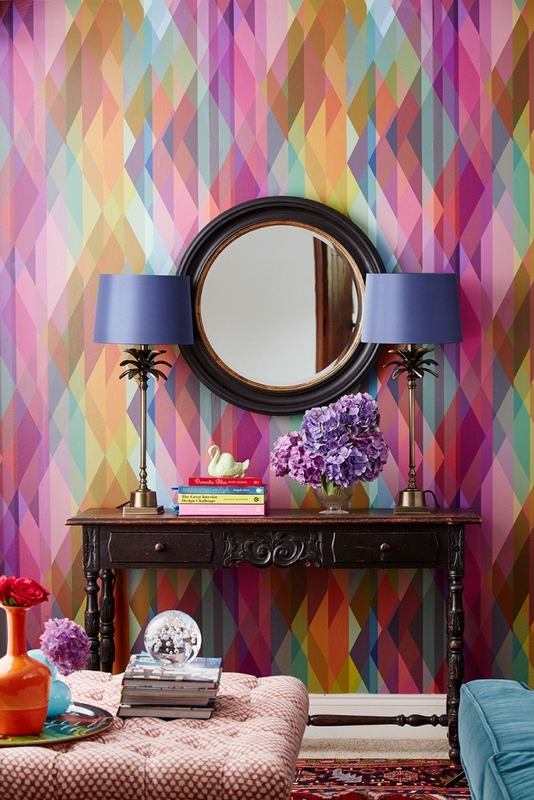 Having said that I’m a sucker for a bold wallpaper as I just love to break the rules! Credits from left: Jacky Al Samarraie Guiseley framed print, £45. Picasso head 1946 farmed print, £195. Central park framed print, £85. All John Lewis. All other items, Sophie’s own. This is a favourite with interior stylists as it gives a really lovely relaxed vibe. Again I like the impermanence of it so you can have fun switching it around later down the road. The key here is to prop pictures of different heights and and I think it works better if they are sightly layered and overlapped. Again I’d think of a colour story, which links them all together. Next you can create a nice arrangement of objects around it, to create different heights. A pile of heavy books in front or some nubs of blue tack will keep the pictures in position. Julia Gash New York unframed print, £10. Julia Gash London unframed print, £10. Julia Gash Vegas unframed print, £10. Julia Gash Barcelona unframed print, £10. All John Lewis. This is a very classic way of hanging pictures but I think again can create real impact. The trend for decorating in very dark colours means arrangements like this look particularly stunning. Precision is key with this one and its essential that you use a spirit level and measuring tape to form the perfect grid. As a rule of thumb I think around 5-8 cm gap looks good. Big point to make here is to hang your pictures nice and low! To often I see pictures too high up and it makes them look a little lost. John Lewis circle wall mirror in black, £150. India Jane palm leaf stick lamp in brass, £145. Gemma tapered shade in navy, £30. All John Lewis. For more ideas on wall mirrors check out here. A large-scale piece of wall art or a mirror is a great way to create a focal point within a room scheme. I like to maximise the impact with a little symmetry so a pair of stunning lamps either side for example really enhances the statement. Again make sure you hang your mirror or artwork nice and low so it is close to the console table or sideboard. It then looks pleasing if you break up the shape with vases and ornaments. This is where I like to break the symmetry, because I like a more relaxed feel in my home. More is more. 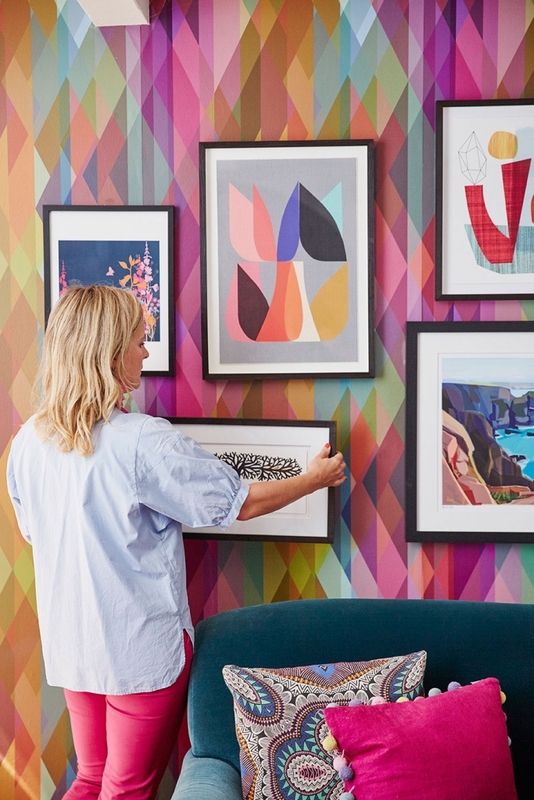 Artwork looks great when it is grouped together either as a gallery wall or symmetrically in a grid or row. Avoid hanging your artwork too high. It looks better when it is hung close above a piece of furniture. Enjoy collecting artwork over time. This way you can add and subtract pieces, helping to keep your home feeling fresh and individual. Consider painting the wall behind the art wall a shade deeper than you dare. Painting look great against this contrast. This was a brilliant read, Sophie. I love all your tips and ideas, which are varied to suit every style. I am delighted that graphic and photographic prints have made a full resurgence, and I really enjoyed your mix of pieces and styling here. I don’t know about you, but I was starting to feel typographic art overload?! I’m also not a fan of the photo-canvas and so I’m delighted they didn’t make the cut here. This was a brilliant article.Good looking one.love to make this type of hang artwork..
Amazingly good looking!!! loving your tips and ideas.Stylish,modern and beautiful hang artwork for a house.Thanks. Wow!! It look really great.Good and useful article.Love the idea of hang artwork.Thanks.